OK, I have finally arrived! The flights to the field from Amsterdam were easy and I was fortunate to have good company – two other expatriates bound to CAR shared the burden of the journey with me. 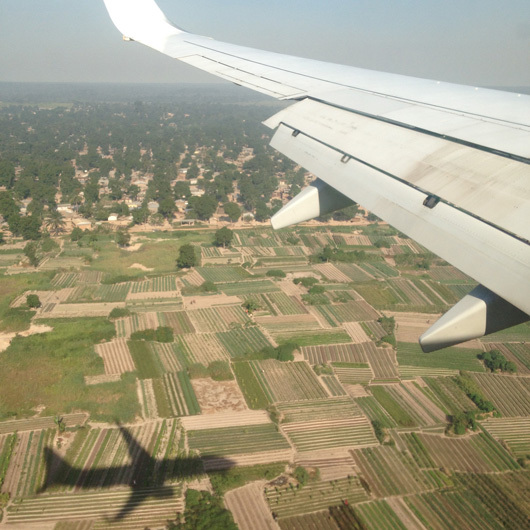 Over the course of a 15 hour red-eye flight we swopped breath mints, field stories and wet wipes in equal measure and emerged blinking dazedly into the African sun in Bangui on Wednesday morning. Owing to a slight confusion with internal flight bookings I have five days to pass with the capital team before I get out to Zemio. After the intensely violent events in CAR of the last few months,necessitating long and arduous working days, much of the team have a slightly frazzled, weary air to them, but I am still greeted kindly and am finally able to be briefed more fully on my forthcoming project and job role. Zemio is way out to the east of CAR and has fortunately escaped the brunt of the last year’s unrest. There’s a refugee population from DRC and internally displaced people (IDP) from elsewhere in CAR in addition to the existing local population. An MSF team of about seven is running primarily HIV, TB and outreach activities as well as maintaining a small hospital for the complex/severe patients. My job this time round is much the same as I was doing in South Sudan – to supervise and train the staff of the outpatient and inpatient departments and pharmacy, but this time with the added joy of being the medical supply responsible for the project – something I dipped a toe into during my last mission. More Excel, hurrah! Except in French this time round... trust me when I say there is not a single emoticon available in the world to express the face I am pulling as I write that! The expat team in CAR are fluent in an embarrassing profusion of languages. Although English and French are the official languages of the mission, in social scenarios it’s common to hear people switch fluidly between additional German, Dutch, Spanish and Portuguese, reaching into their other vocabularies for lost words or difficult concepts. I have literally never been more mortified to be so hopelessly monolingual and am determined to keep working on my French to the point where I will someday soon actually be able to function without my pocket dictionary that is already beginning to look somewhat well thumbed. The MSF French website – an incomprehensible mystery to me a scant two months ago – is now readable (albeit slowly) and for company in the evenings I have “Harry Potter et la relics de la Mort” (“Deathly Hallows”) – although i think it’s probably cheating to read something that I have practically memorised in English already. Bangui is a somewhat sprawling city; mostly low buildings, wide red roads, minimal traffic and a pleasing abundance of trees and lush greenery, which after the flat drabness of South Sudan and the grey/beige that is British winter is rather delightful to the eyes. The large IPD camp clustered close to the airport fence remains, but the numbers inside are gradually dwindling as people begin to return to their homes in and around the town. The prevailing hope is that the slow calming of the situation here will hold. At night however the rattle of gunfire can sporadically be heard from distant quartiers of the city, an audible reminder of the recent carnage, and the precarious security now gained. To my novice ear, the Central African French accent is rich and musical to hear and sentences are periodically interspersed with words from the original local language. I let entire conversations between national staff wash over me luxuriantly, picking out a few key words here and there to try and piece together the gist of the conversation. Listening intently for any length of time is curiously draining and at the moment any form of response required from me greater than a “oui” or a “non” elicits a panicked look followed by an expression of somewhat tense concentration on my part. Context and props are helpful – if someone is waving a coffee cup in your direction while speaking you can be fairly sure that they are not planning a trip to the airport any time soon! Conversely, any conversation where an anonymous piece of paper is being energetically displayed requires rather more concentration to interpret! And radio communication is um, well, best kept brief. But already sentences are flowing from me with greater ease – and my confidence and vocabulary are growing slowly.